Cut off both ends of the kiwis. Slice and peel them. 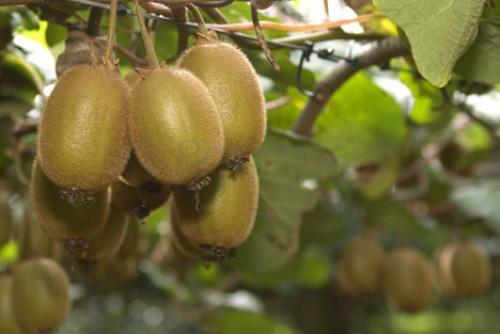 Place the kiwi slices in a microwave-safe bowl (1 liter or 1 quart.) Mix in the sugar, white wine, and vanilla beans. Cover with plastic wrap and poke a hole in the center to release the steam. Cook on high (1200W) for 2 minutes. Let it sit and cool before serving. For Syrup: Bring all ingredients to boil in heavy medium saucepan. Boil until liquid is reduced to 3/4 cup, about 25 minutes. Using small sharp knife, scrape vanilla seeds into syrup; return bean to syrup. Cool. (Can be made 1 day ahead. Cover and store at room temperature). For Fruit: Cut peel and white pith off oranges and grapefruit. Using small sharp knife, cut between membranes of oranges and grapefruit to release segments. Cut each kiwi into 8 wedges. Cut pineapple into 1/2-inch-thick slices. Drain fruit. Place in bowl. Discard vanilla bean and star anise from syrup. Pour syrup over fruit and stir to combine. Serve. Stir first 5 ingredients in small saucepan over medium-high heat until sugar dissolves. Bring to boil. Reduce heat; simmer until liquid is syrupy and slightly reduced, about 8 minutes. Remove from heat. Stir in vanilla. Arrange orange and kiwi slices in shallow bowl. Pour hot syrup and spices over fruit. Chill at least 1 hour and up to 4 hours. Sprinkle almonds over. Serve. Cut pineapple lengthwise through crown. Remove fruit with curved knife, leaving shells intact. Trim off core and cut fruit into chunks. In large bowl, combine pineapple, orange, kiwi, strawberries and grapes. To make dressing, in a 1-quart measure, combine remaining ingredients, except banana. Pour dressing over fruit. Toss gently to coat. Refrigerate, covered, 1 hour. Just before serving, slice banana into fruit salad. Toss gently. Spoon salad into pineapple shells and serve. In a bowl, combine the peaches, berries, kiwi and grapes. In a microwave-safe bowl, combine the jelly and water. Microwave, uncovered, on high for 45 seconds or until jelly is melted; stir until smooth. Drizzle over fruit. In a saucepan, bring the first five ingredients to a boil. Reduce heat; cover and simmer for 5 minutes. Remove from the heat; let stand for 15 minutes. discard cinnamon stick; chill. Meanwhile, in a glass bowl, layer half of the strawberries and all of the nectarines, grapes and oranges. Top with kiwi and remaining strawberries. Stir juice mixture and pour over fruit; do not mix. Chill for 30 minutes.